Pair of elegant Asian armchairs made of elm with mother-of-pearl inlay depicting birds and floral motifs. beautiful chair with a fantastic mother of pearl inlays. Solid tropical wood. One-of-a-kind 19th century Savonarola chair features intricate foliate carvings with stunning mother-of-pearl inlay. Handmade in Syria. All inlay is intact, no missing pieces. Pair of middle eastern mother of pearl inlaid and carved armchairs, late 20th century. Pair of 1950s Asian armchairs. Wonderful, antique, mahogany armchair circa 1860s features a spindle back, wide arms and decorative mother-of-pearl and boxwood inlay detail on the back rest. 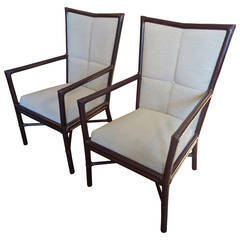 Pair of 19th century Asian teak armchairs with pierced back supports with marble inserts. Measures: Seats 18.5” H.